There are few things in life as painful as the loss of a child. The natural order of things dictates that parents are supposed to enter the great hereafter before their children. Losing any loved one is difficult, but to lose a child seems unnatural and without reason. This makes finding the right type of child loss sympathy gifts nearly impossible. From all of the gifts you buy throughout your life to show your friends and family how much you care about them, none are as difficult to choose as sympathy gifts. The unexpected loss of a child through an accident or illness is very hard to deal with. Your friends need your emotional support more than anything at such a time. Unless you have experienced such a loss yourself, you don't know how severe and deep a pain they feel. Nothing can tell the bereaved parents how deeply sorry you feel about their loss. No ordinary gift can ease their pain. But, there is one type of special gift that can show your friends how much you care. Typically, the parents will receive flowers and sympathy cards. Of course, these sentiments are appreciated, but why not give a truly unique gift? One that may give the parents a small glimmer of hope for a future without their child? A gift that shows them you put a lot of effort and thought into choosing a gift unlike anything they have ever seen before. This is the gift of hope and wishes; the thing they wish for most will never happen, but they may feel a little less pain when they see this chic, unique gift designed especially with them in mind. Child loss sympathy gifts from Captured Wishes take all of the wishes of happiness and pain relief that you want to express and put them into a special little bottle. Finding the words to express how you feel is not easy. That is why each Captured Wishes gift comes with a unique verse, designed for just this occasion. Every time the bereaved parents hold this unique vessel in their hands and read the special verse, they may feel a bit of retreat from the deep grief that has taken over at the loss of their child. A Captured Wishes gift is a unique bottle filled with magical pixie dust. The pixie dust is symbolic of wishes carried to the heavens in hopes of everlasting peace. Child loss sympathy gifts have layers of hope, memories and love. 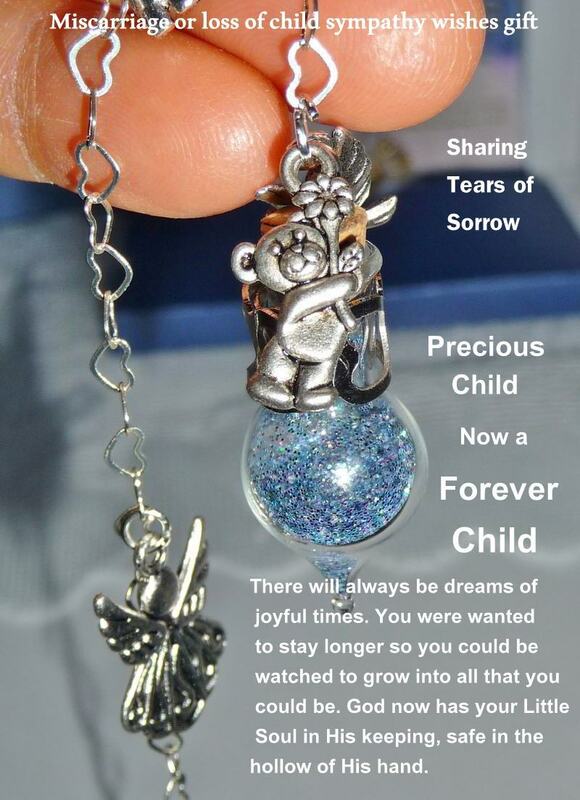 Each gift also comes with special charms the bereaved parents can wish upon when the sorrow becomes too much to bear. Holding this magical tear-shaped orb of glass may not relieve all of their pain, but thinking about you and how much you cared (to give such a unique gift) is a comfort in knowing they are not alone with their sorrow; it will help them get through the day. When parents lose a child, they need to know they have friends that will stick by them and help them through the pain. They need a shoulder to cry on and a hand to hold. You can't always be there for them, so when you can't be there, a magical Captured Wishes child loss sympathy gift can be; a small symbol of your love that they can take out and hold whenever they need the love of a friend. Every time they see this unique little vessel, their hearts will swell with love and joy. Knowing they have a friend like you might make it a little bit easier for them to go on and face another day.